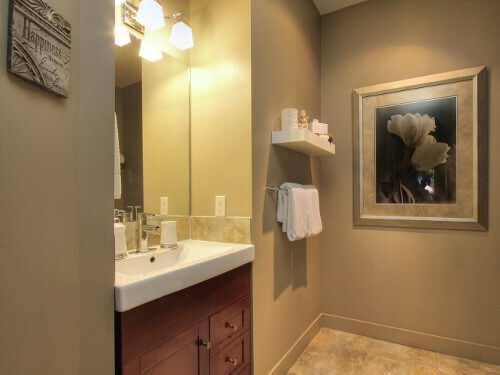 This enchanting guest suite is luxurious and is self contained with private entrance. 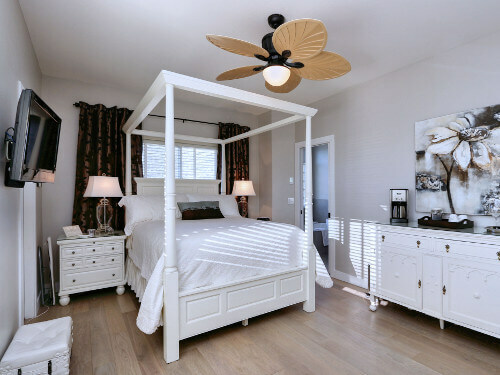 Once inside, open French doors to large master bedroom with beautiful 4 poster king bed with fine linens. Sit and relax in chocolate leather chairs and enjoy the modern electric fireplace or watch a romantic movie after a long day of site seeing. There is a hint of romance in the air. 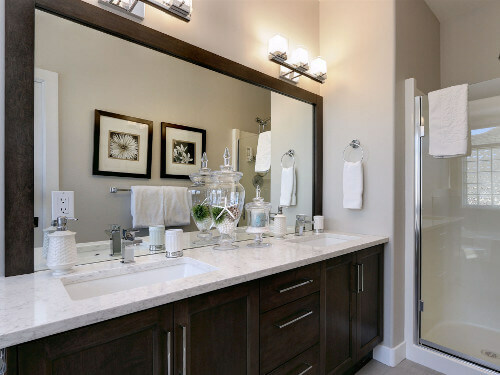 The ensuite is lavish with heated floors, deep soaker tub, candlelight and bath robes to snuggle up in. 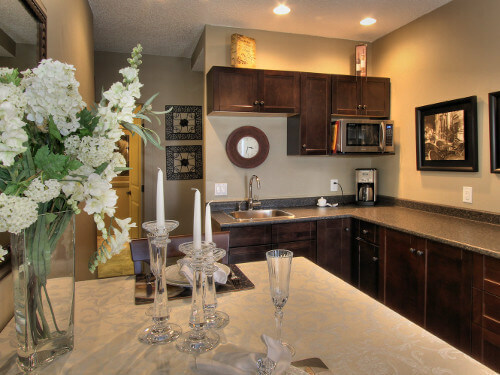 The main area has a maple cabinet mini bar- kitchenette, dining table, sitting area and chandelier. 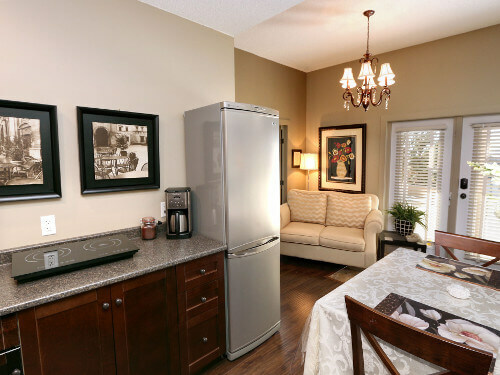 Kitchenette includes, bar fridge, microwave, sink, toaster, dishes, glassware and utensils. 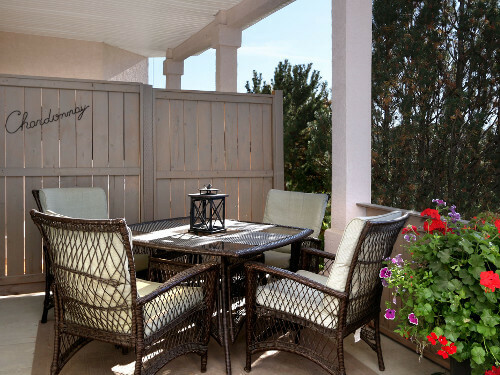 Step outside to your private patio where you will find flower baskets, fountain and a breathtaking view of the lake and city. It is perfect place for breakfast or lounging after a full day. 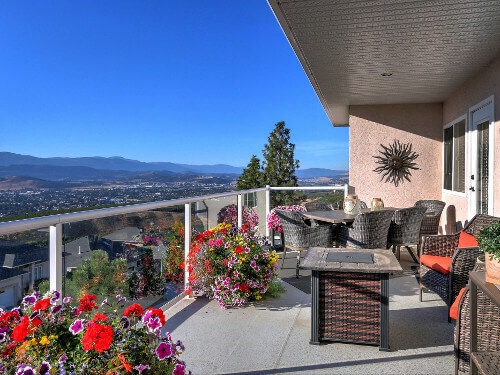 At night you may want to sit out and overlook a panorama of city lights while sipping on a glass of fine Okanagan wine. All is here for your enjoyment and relaxation. 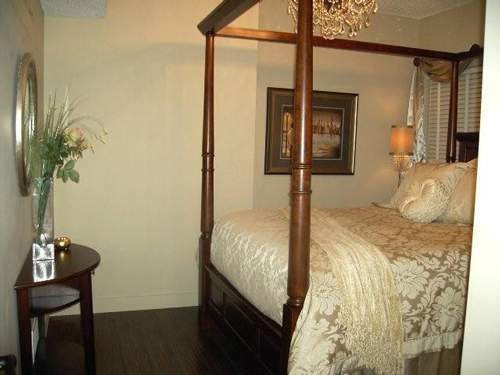 This beautiful guest suite has a gorgeous queen four poster bed, luxury bedding and 32" flat screen TV. 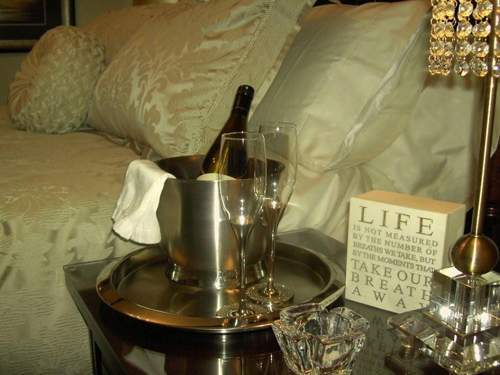 It may be the smallest of the three suites but it is loaded with charm and romance!!! It includes a full en suite with air massage soaker tub perfect for two, shower and double sinks. 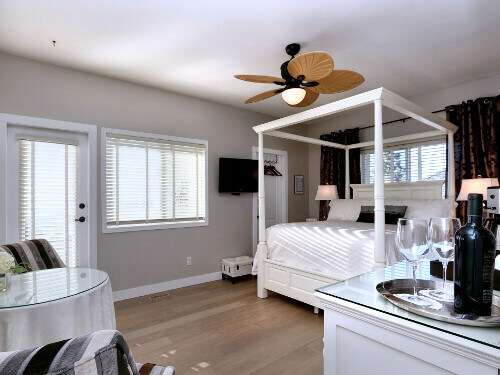 The bedroom also has its own seating area with comfy slipper chairs, dining table perfect to sit, relax and sharing a few appies with a sip of crisp white wine after a long day of touring. The buffet is fully equipped with coffee maker, kettle, dishes, cutlery, glassware and mini fridge. 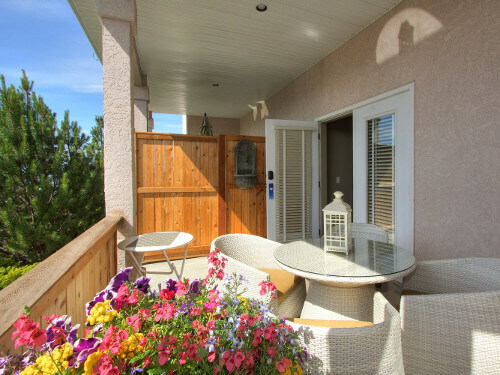 Step outside to your patio where you can enjoy the panoramic view of the city and lake. In the evening the city lights will take your breath away and the morning sunshine will get your day off to a wonderful start. Isn't life grand!!! 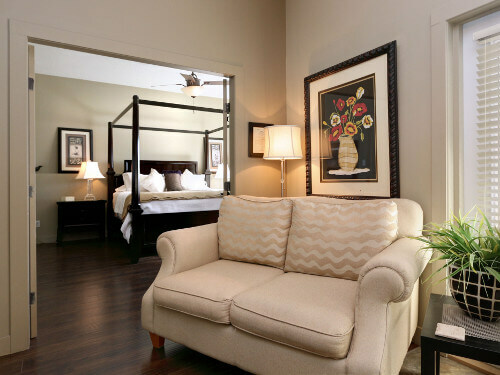 This all new romantic guest suite is both spacious and comfortable for any short or long stay with private entrance. It has two beautifully decorated bedrooms so it is suitable for 2 to 4 guests. 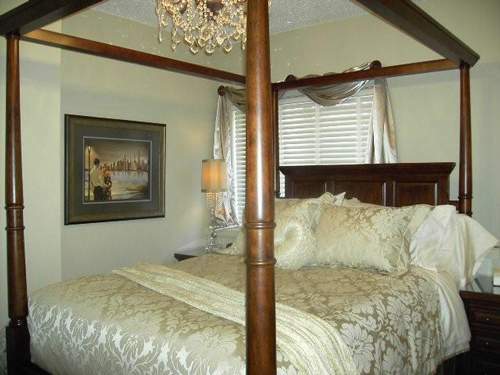 The master bedroom has beautiful queen four poster bed with crystal chandelier and fine linens. 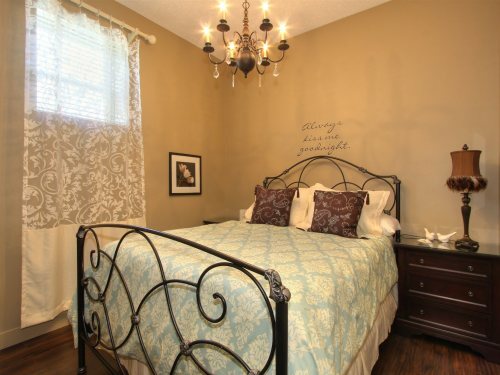 The second bedroom has an amazing queen wrought iron bed and matching chandelier. 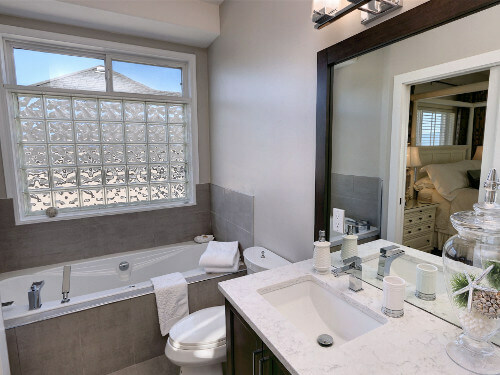 Bathroom has tub and shower. 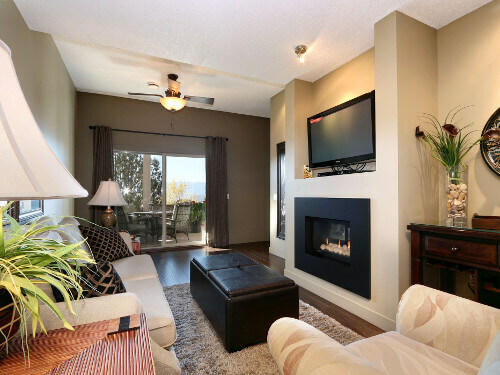 Sit in your living room and relax in front of a gas fireplace and watch a movie on the 42” flat screen TV or step outside onto the private patio and smell the sweet scent of apple orchards nearby while overlooking the lake and city. At night the sparkling city lights will dazzle you and make a perfect finish to a long day. The kitchen has dining table and is fully equipped with fridge, stove, sink, dishwasher, pots, toaster, dishes and utensils. It is perfect for light meals when you just want to stay in. Relax and enjoy in style! A full breakfast or self serve breakfast is available. Breakfast is served in the dinning room or on the upper patio weather permitting. If you have a special occasion and want us to help, please let us know. 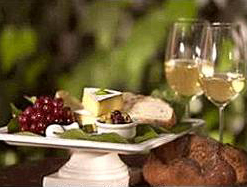 We would be happy to help make that special occasion memorable. Examples: Long stem roses in room, chocolates, bubbly, scented candles. Copyright © 2019	The Hopeless Romantic Kelowna Bed and Breakfast All Rights Reserved.